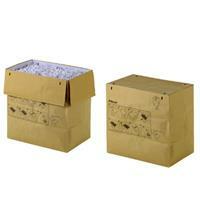 This pack of 50 recyclable waste bags are suitable for Rexel shredders with a 70 litre bin capacity. The sacks themselves are made of recyclable material, meaning you can recycle the whole thing rather than have to empty the contents and dispose of the sacks separately. The bags are also self-seal which makes waste disposal clean and efficient.